21 February. An explosion of gunpowder and colored fumes in the Pompeii Amphitheater to retrace the tragic dynamics and, at the same time, life of the eruption of Vesuvius, in a timeless poetic journey that recounts the war and the rebirth to new life of Pompeii. It is the only event of the artist Cai Guong-Qiang that on February 21st from 12 noon in the Amphitheater says place to the “Explosion Studio”: an artistic explosion that, with its phases, will repropose as soon as the tragedy that shook Pompeii but also its fortunate discovery, able to bring to light excellent historical and archaeological remains. The works created by the artistic explosion will be “excavated” and then transferred to the National Archaeological Museum of Naples) for the inauguration, scheduled for February 22 at 4.30pm. Until May 20, 2019, scattered in the museum spaces (from the Farnese Collection to the frescoes section, from the atrium to the mosaics), works by Cai Guo-Qiang will tell the indissoluble link between past and present, oriental and western culture. 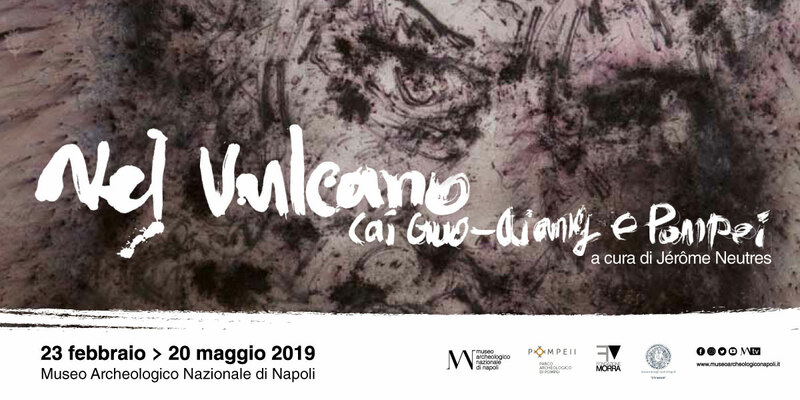 The exhibition is curated by Jérôme Neutres, the project is hosted by the Archaeological Park of Pompeii and the National Archaeological Museum of Naples, the realization of Il Vulcano was made possible thanks to the organizational support of the Morra Foundation. The artist Cai Guo-Qiang continues, with this multi-faceted creative experience, his activity in Italy, after the successful performance with fireworks in Florence (City of flowers in the sky) and of our personal Flora Commedia: Cai Guo Qiang in the Uffizi, a treatise on the broader project of a man in the history of Western Art by Cai Guo-Qiang. An unumum, due to the infinite charm of the place, will be the explosion at the Pompeii Amphitheater: in the center of the arena, canvases of different sizes and copies of objects related to the daily life of Pompeii, but also reproductions of sculptures of the MANN (Venus Callipigia, Ercole and Farnese Atlas, bust of Pseudo-Seneca) will be placed on a canvas of 32 meters by 6, supported by a platform. Explosion Studio: They evolve in three moments: I. Unleashed by the evocative chapter “Tela della Civiltà”, small explosions destroyed and artifacts on the canvas, marking them violently and with the same of the Vesuvius; II. After a short time, the fireworks have settled for the unstoppable volcanic. The fireworks will incarnate a theatrical heavy “sigh”, that of the rise and fall of human civilization; III. In closing, the “Scavo” will follow: among the residual fumes, the artist and his team will bring to light the “archaeological ruins”. The canvas, marked by the Explosion, will be filled with images and colors inspired by the objects discovered in Pompeii, now preserved in the MANN. “Pompeii is a place of the contemporary. I take up this thought of Massimo Osanna, to whom we owe the promotion of this project, which I find very significant,” declares the interim Director of the Archaeological Park of Pompeii, Alfonsina Russo -Pompei, suspended in time, it has always captured the imagination and the creative spirit of every age, reminding us that that tragic event of 79 AD imprints it in the collective memory for eternity, not only for its history and unique testimony of an era , but also for the profound sense of fragility and impotence to which we are constantly referred “. After the Explosion Studio in the Amphitheater, the path “In the volcano” will find natural completion in the exhibition at MANN.